Abundant sunshine. High 94F. Winds NW at 5 to 10 mph..
A clear sky. Low 62F. Winds SSE at 5 to 10 mph. Palo Verde coach Leon Stallworth watches his team, including his daughter Sydni, run through a shooting drill during practice. 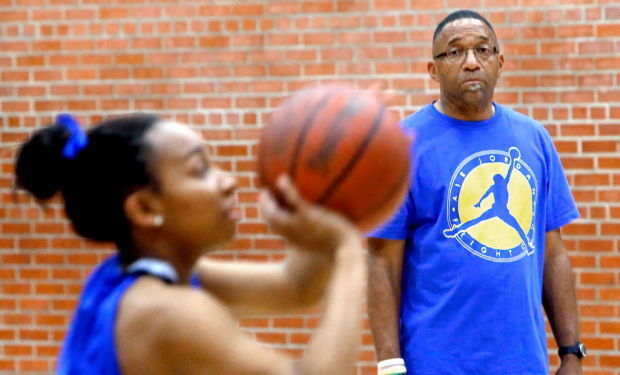 Leon Stallworth left his job as a boys basketball coach last year so he could watch his daughter play. He has a pretty good seat. Heading into Thursday night’s game at Sahuarita, Palo Verde — coached by Stallworth and led by his daughter, Sydni — had won 10 of 11 games to improve to 17-8. Sydni, a junior, is one of the state’s top scorers. Sydni Stallworth sure is a blessing for the Titans, too. The 5-foot-5-inch point guard is averaging 23.6 points per game, 17 more than anyone else on the team. She also leads the team with 9.1 rebounds, 5.7 steals and 3.2 assists per game. She had one of her best games of the year Tuesday, when she single-handedly outscored host Benson with 36 points in a 55-30 win. Stallworth led the team with 21 points per game as a sophomore, but Palo Verde finished 9-18 after going 26-6 and making the state quarterfinals a year earlier. The Titans, ranked 20th in Division III and primed for a trip to the state tournament, are starting to look like contenders again. Seven players regularly score for the Palo Verde, but Stallworth, a third-year player and team captain, is still the big leader for the Titans, who have home games against Safford and Morenci next week. Wins there would secure a spot in the section tournament and possibly the state tournament, too. “We wanted to change the culture around here and get it back to a winning attitude,” coach Stallworth said.